Dishesfrommykitchen: TAWA PULAO ! KIDS LUNCHBOX ! 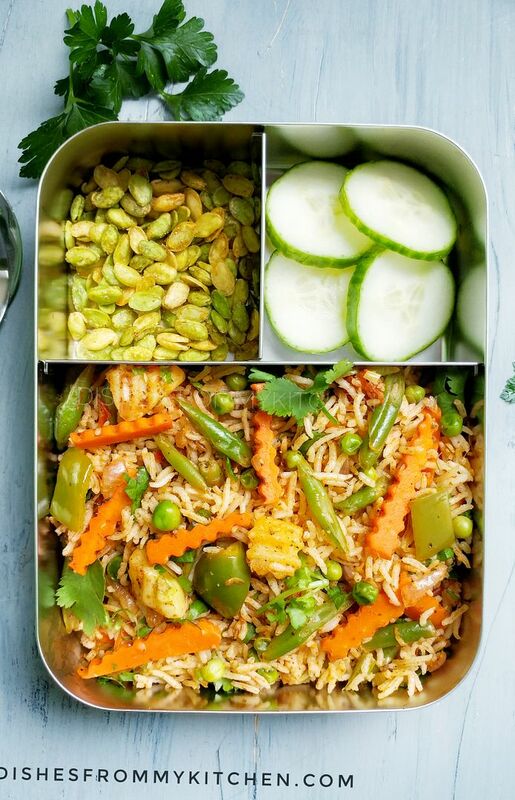 Lunch Box : Tawa Pulao, Cucumber and Avarekaalu (Fried field Beans snacks) ! 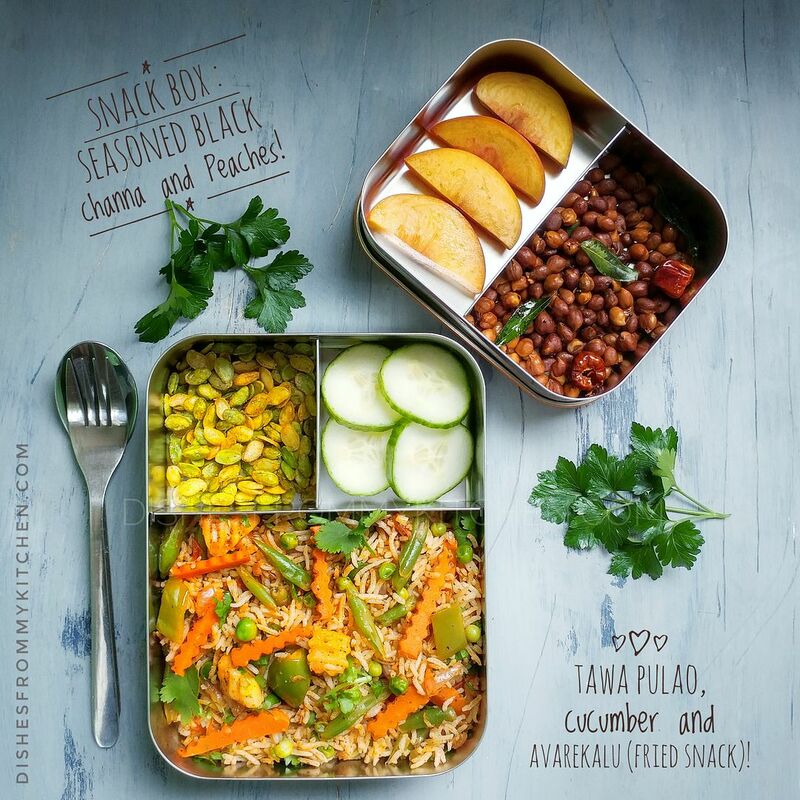 Snack Box : Seasoned Black Channa and Peaches ! 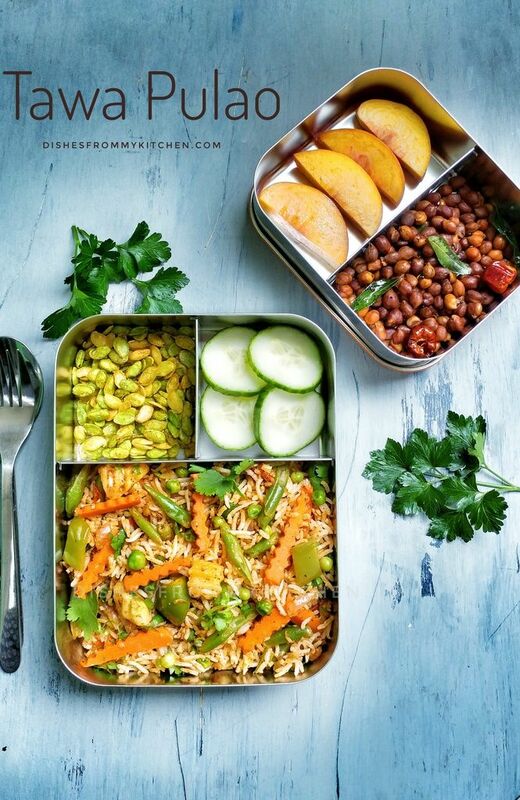 Do check my Facebook Page for More lunch box ideas and also click this link for more Lunchbox recipes Click this Link Lunchboxes. 1. Clean and Wash Basmati rice. Soak them for 20 minutes and cook rice with 1 1/2 cups of water. Cool them and make sure the grains are separated. If you are going to make this recipe for lunch box in the morning. You can Cook the rice and refrigerate night before. Left in the fridge overnight, the rice grains will firm up, making it easier to separate and decreasing the chances of Tawa pulao turning out mushy. 2. Steam all the vegetables and Keep it aside. Make sure vegetable are nice and crisp. Don't over cook them.Its enough if you cook 3/4th. 2.Heat oil and butter in the pan. Add Cumin seeds. 3.Add finely chopped onions when it become translucent, add Ginger + garlic paste. Saute till raw Aroma disappears. 4.Add chopped tomato and little salt. Add spice powders. Saute until tomato becomes Mushy. 5. Now add all the vegetables and crushed Kasoori Methi. Stir them couple of minutes and add cooked rice. 6.Add salt and squeeze Lemon juice. Toss the rice until everything is mixed well and rice is nicely coated with the vegetable Masala Mixture. When Rice becomes hot enough switch off the flame. 7. Garnish with Chopped coriander. PLEASE DO NOT COPY THE RECIPE OR PICTURE. YOU ARE MOST WELCOME TO USE THIS RECIPE WITH THE DUE CREDIT.